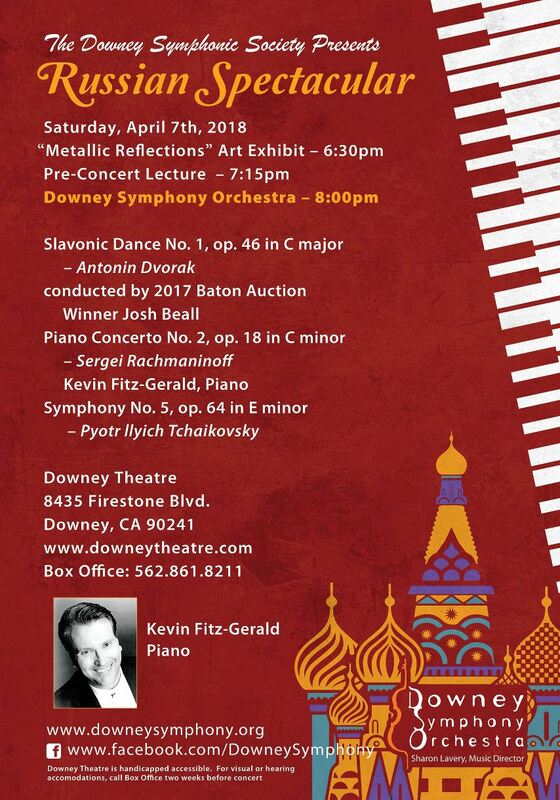 Come join the Downey Symphony Orchestra for a Russian Spectacular! “Join us as we conclude our 59th season with some spectacular Russian flair: Tchaikovsky’s Symphony No. 5 and Rachmaninoff’s Piano Concerto No. 2. You won’t want to miss the return of international piano sensation Kevin Fitz-Gerald as he dazzles you with his exquisite and vibrant playing. As we do every year for our spring concert, the program will open with a piece conducted by our Baton Auction Winner. This year’s lucky recipient is Josh Beall and he has chosen the impressive Slavonic Dance No. 1 in C major by Dvorak to kick-start this exciting evening.